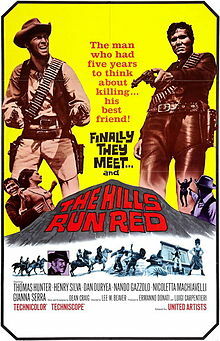 THE HILLS RUN RED was a 1967 spaghetti western starring Thomas Hunter, Dan Duryea, and Henry Silva. It was a co-production with Dino de Laurentiss and the Spanish Cb Films studio, though the latter had a strong deal with American International. It appears, to me anyway, an attempt was made for this to appear as a Hollywood production for the American release. Thomas Hunter and Dan Duryea are in the film, not unusual for the spaghetti film genre, but most of the production principals hid behind “Americanized” names. Director Carlo Lizzani was billed as Lee W. Beaver, Ennio Morricone did the music as Leo Nichols, script by Piero Regnoli as Dean Craig. It’s one of the better westerns in this genre, a revenge story where a man spends five years in prison, courtesy of the government, after the Civil War, betrayed by his friend when they were fleeing with a half million in cash. The low man in the card cut was supposed to stay with the wagon and cash while the winner bailed out and hid. Jerry Brewster(Thomas Hunter) was the loser and the two parted. Unknown to Brewster, his friend, Ken Seagull, grabs the money when he leaps from the wagon, leaving Jerry to get a beating from the Union troops and a five year prison sentence. When he’s finally released, he returns to his home, only to find it abandoned, in ruins. A diary in his wife’s hand reveals what happened. Seagull had returned home with a large sum of money, refused her a loan, and she and their son were not doing well. He lwearns later that she’d died four years before, the boy, six, had been taken in by the blacksmith. Seagull had had men watching the prison and, upon his release, had his foreman, the maniacal Garcia Mendez(Henry Silva) send a couple of men to kill him. One knew what he looked like and they intercepted him at his former home. Unarmed(the prison didn’t return his pistols, confiscated, only the empty holsters), Jerry’s running and hiding when a fellow pops up and throws him a pistol. An older man, when it’s settled, reveals the name Winny Getz(Dan Duryea). All through the picture he helps Jerry at convenient times, his motivations unrevealed. I always knew there was something odd about him and we find out at the end of the film. Henry Silva steals the movie with his over the top interpretation of the black-clad foreman of Seagull, now calling himself Ken Milton. Nice, violent spaghetti western. Enjoyed it thoroughly. The American release tacks on the obligatory happy ending and the DVD version carries it. On IMDB, it said the original is relegated to now poor VHS copies.